This central Barcelona apartment for 4 is equipped with state-of-the-art facilities ensuring you feel completely at home. It is located in the Eixample neighbourhood of Barcelona, close to the bustling Plaça Catalunya and Plaça Espanya. 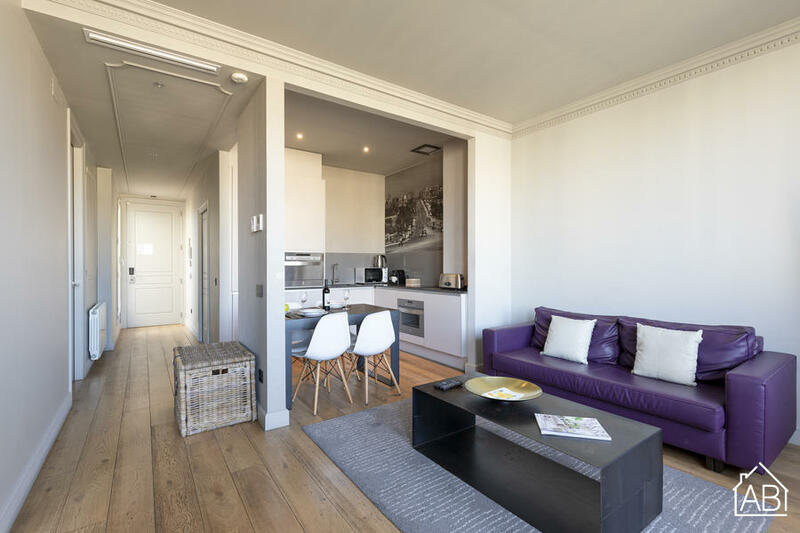 The apartment is within walking distance to many popular places in Barcelona and is well connected to the rest of the city, and other areas of Catalonia by public transport including bus, train and metro. Equipped with modern, designer furniture, this apartment has a total of 2 bedrooms meaning it can comfortably sleep up to 4 people. There is a coffee maker, a dishwasher and a washing machine for your convenience. You can also make the most of the 150m2 communal terrace, complete with sun loungers. There is an Internet connection in this recently renovated apartment. On the ground floor of the building you will find a 24 hour reception and concierge service should you need anything at all. The building is equipped with security cameras throughout. Complete with air conditioning and heating, this luxurious apartment is the perfect Barcelona home at any time of the year.